James was born and raised in Kansas City, Kansas, Argentine area. Graduating from J.C. Harmon H. S.; James also excelled in An Entrepreneurship Program in Texas. Church affiliations began as a young child in St. Paul A.M.E Zion Church, joining Bridge Builders International in Arlington, Texas on November 25, 2018. Upon arriving home to Kansas James fellowshipped with The Greater Pentecostal Temple. James’ love for his Lord was evidenced through his journey’s daily life. James leaves to cherish his memories his parents: Xavier and Donald Estell; P. Scott and siblings. Also celebrating his home going are his children, and grandchild, and fiancée Yvette Miller. 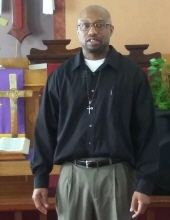 Visitation and funeral services will be held at St. Paul A.M.E. Zion Church at 4000 S. Minnie St. Kansas City, Kansas on Friday, February 15. 2019; 10:00 AM Visitation and 11:00 AM Funeral Service. Interment will follow at Highland Park Cemetery at 4101 State Ave. Kansas City, Kansas 66102. Services entrusted to Highland Park Funeral Home, Kansas City, Kansas. To send flowers or a remembrance gift to the family of James LeRoy Kelley, please visit our Tribute Store. "Email Address" would like to share the life celebration of James LeRoy Kelley. Click on the "link" to go to share a favorite memory or leave a condolence message for the family.